The holiday season is already upon us and folks are getting together for special occasions. For our December meeting OLHD wanted to also do something special. Back by popular demand OLHD is excited to announce the return of local trolley enthusiast Keith Stephenson who will be presenting “Portland Trolleys – Gone But Not Forgotten, Part II”. 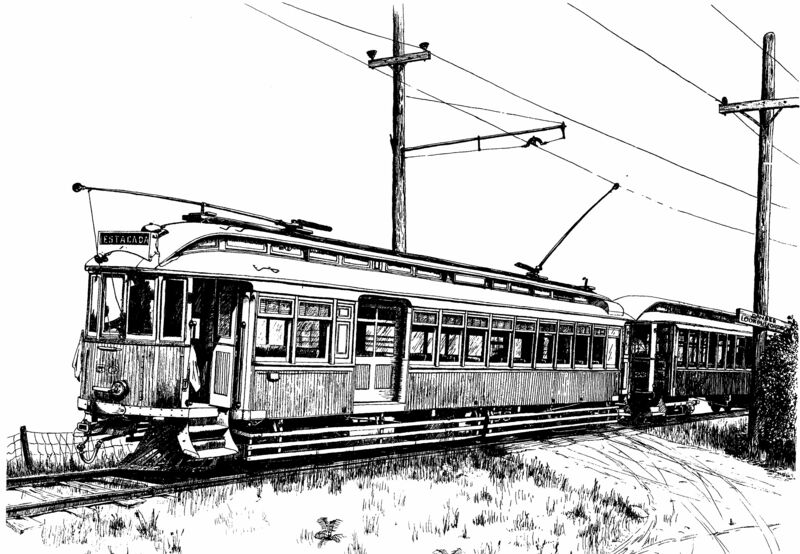 As a continuation of his March 13th presentation Keith will be teaching us even more about the history of Portland’s trolleys from 1891 to 1958 using displays, slides, and the video “Last of the First Interurban” by David Haij. Join us on December 11th for a fun-filled evening of trolley history! 14496 S.E. River Rd. @ Maple St. In addition to our routine business items at our next meeting we are pleased to have guest speaker Lee Spurgeon join us to talk about how Donation Land Claims (DLC's) began in Oregon, and what was involved in mapping a great Western wilderness. Lee is a licensed professional surveyor and comes from a family of professional surveyors. Lee will share stories about the early land surveys, how they were done, where they were recorded, how you can find out more about your own property, and why it is helpful to know about the DLC that you live on. He will also discuss the geopolitical climate that spurred the United States Congress to create Donation Land Claims. Lee has his business located in downtown Oregon City in a building whose history stretches back to the 19th century, and he loves historical research. Join us on Nov.13th for a presentation you won't want to miss. It has been a long, warm summer. But fall has arrived, the rains are coming, and our travel, outdoor recreation and yard activities are subsiding. It has been a very busy summer with our passion for history having to take a back seat to all those summer activities. Now it is time to satisfy some of those history cravings again. This month&apos;s meeting will primarily be catch-up time. We will review where we left off in June, find out what has been happening in our community over the summer months, and learn what is on tap for November. Please join us on Oct. 9th! At our last meeting we enjoyed viewing the OLHD interview with Nancy Hersey, daughter of Harvey Starkweather who was a well-known and highly respected member of this community. Though we have more interviews to watch, yours truly no longer has access to a projector. So I will need to purchase one before we can view another interview or view images we have acquired. Thus our June meeting will be a combination of business and an open forum. This meeting will be our last until September, as we usually take a break in the summer months. However, we will try to schedule a field trip or two during the summer break while the weather is good. So stay tuned for those. Please join us on June 12th and find out what local history has been unearthed over the last month, learn about upcoming events, and help plan a couple summer history outings. At our last meeting we viewed, and were entertained by, the 2011 interview with the Briggs sisters - Enid Briggs and Adele Wilder, descendants of the Milwaukie/Oak Grove Birkemeier family. Our May meeting will be conducted by OLHD Co-Chairman Baldwin Van der Bijl, and for the history segment we have arranged to view our 2011 interview with Nancy Hersey. Nancy is a daughter of Harvey Starkweather who was a well-known and highly respected member of this community from his birth here in 1868 until his death in 1951. He was the son of Oregon pioneers William A. Starkweather and Eliza Gordon and married Alice Risley in 1894 - the daughter of pioneers Jacob S. Risley and Mary S. Scholl. Harvey was renowned as an educator, local politician, historian and farmer. Nancy's knowledge of these families and their impact on our local history is unparalleled. Nancy's family history reads like an Oregon history textbook and her own life experiences are fascinating. You won't want to miss this first-hand account of some of our local history. Please join us on May 8th! At our last meeting we enjoyed a video presentation by trolley enthusiast and Oak Grove resident Keith Stephenson, during which we were treated to two hours of historic footage of Portland trolleys. Due to a lack of adequate time the slide presentation which we had prepared for that meeting has been postponed until one of our fall meetings, at which time Keith has agreed to return. For our April meeting, in addition to our regular business, our History Segment will feature our 2011 interview with the Briggs Sisters - Enid Briggs and Adele Wilder, descendants of the Milwaukie/ Oak Grove Briggs and Birkemeier families. As always, OLHD membership renewals will gladly be accepted at this meeting. Membership dues is what allows us to purchase supplies, the badly needed interview equipment, and interview transcriptions. Join us April 10th and treat yourself to another taste of our local history! This month's meeting will be devoted almost entirely to a presentation by Oak Grove resident and trolley enthusiast Keith Stephenson who will be presenting "A History of the Portland Traction Company". In addition to his collection of trolley memorabilia Keith will be showing slides and videos of many of the trolleys that served the Portland area during the trolley era. An avid member of the Oregon Electric Railway Society and former volunteer at the Oregon Electric Railway Museum, Keith will be sharing with us his vast knowledge of our once thriving electric railway system. Join us on March 13th. You won't want to miss it! At our last meeting in January we watched the OLHD interview with Bob Moore and his wife Charlie - owners of Bob's Red Mill. Conducted by our own Punky Scott of the Bomber Restaurant I think we were all agreed that it was a terrific interview. On February 13th we will view another of the interviews we did in 2011. So bring along your notepads and pencils, and poise yourselves for another great glimpse into our local history through the eyes of someone that's lived here most of their life. Join us Feb. 13th and treat yourself to another taste of our local history! Well, we've made it to another year. 2013 was a great year for discovering some of our local history, and 2014 will no doubt prove to be just as fruitful. At our next meeting we will be enjoying another of our 2011 interviews of local residents. As we ease into conducting more interviews these earlier ones remind us what treasures we have in our midst. Join us January 9th and treat yourself to another taste of our local history!